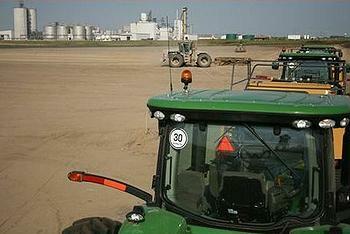 NEVADA, Iowa, December 11, 2012 – Science and engineering company DuPont has started construction of a large cellulosic ethanol biorefinery in Iowa, with completion expected in mid-2014. Once fully operational, the facility will produce 30 million gallons of cellulosic ethanol a year from corn stover residues, a feedstock composed of corn stalks and leaves. The stover will be collected from farms in a 30 mile radius around the new facility. This US$200 million facility will be among the first and largest commercial-scale cellulosic biorefineries in the world. The company says this first commercial facility will require a capital investment of about $7 per gallon of annual capacity. When the facility is completed, DuPont plans to license the biorefinery’s integrated end-to-end production system globally. The facility has been 10 years in development. The use of advanced biofuels such as ethanol made from the cellulose in plant materials can result in fewer greenhouse gas emissions. An International Organization for Standardization compliant, peer reviewed life cycle assessment of the DuPont biorefinery and supply chain indicates a potential greater than 100 percent reduction in greenhouse gas emissions compared to gasoline. The company says this greenhouse gas reduction is enabled by use of cellulosic co-products as a source of renewable energy. The DuPont biorefinery co-product is a combustible material that can displace coal in facilities currently burning this fossil fuel. Regional businesses and academic institutions have already indicated interest in exploring the potential use of the renewable co-products to replace portions of the coal they now burn in their operations. “By leveraging DuPont Pioneer corn production expertise and designing an integrated technology platform, we’ve built an affordable and sustainable entry point into this new industry,” said Collins. “We’re committed to continued productivity gains to drive costs down even further for the coming generations of plants, ones based on corn stover as well as other feedstocks,” Collins explained. DuPont is already processing switchgrass in the cellulosic ethanol testing facility it owns jointly with the University of Tennessee near Knoxville, Tennessee. On November 30, Collins was joined by Iowa Governor Terry Branstad to celebrate the official start of construction on the biorefinery at a ceremony held at the construction site next to the grain ethanol facility Lincolnway Energy. To supply the corn stover that will be converted into ethanol, DuPont will contract with more than 500 local farmers to gather, store and deliver over 375,000 dry tons of the material per year to the Nevada facility. “Many of us who have participated in the stover harvest program with DuPont are already seeing benefits of this alternative residue management strategy including positive effects on grain yields the following year on our fields,” said Jim Hill, a corn grower whose stover will be used to supply DuPont’s biorefinery. “We’re excited to work with DuPont to supply stover to this new biorefinery, partner to discover new markets for our products and co-products and develop new crop production techniques based on the opportunity to manage residues thru partial stover removal,” said Hill. In addition to the estimated 60 full-time plant operations jobs, DuPont anticipates hiring about 150 seasonal workers for collection, stacking, transport and storage of the stover feedstock during each harvest. 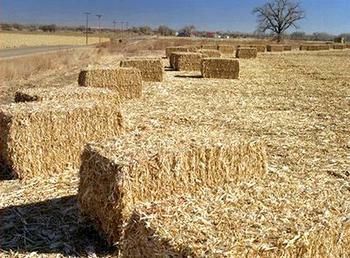 The cellulosic ethanol industry has been struggling to catch traction in lean economic times. In November, BP ended plans to build a $350 million, 36-million-gallon-per-year plant in Highlands County, Florida, but other large companies are moving forward. The Spanish company Abengoa is constructing a 25-million-gallon-per-year cellulosic ethanol biorefinery in Hugoton, Kansas, with a $132 million government loan. Corn ethanol giant Poet, based in Sioux Falls, South Dakota, is building a 25-million-gallon-per-year facility in Emmetsburg, Iowa with private financing.